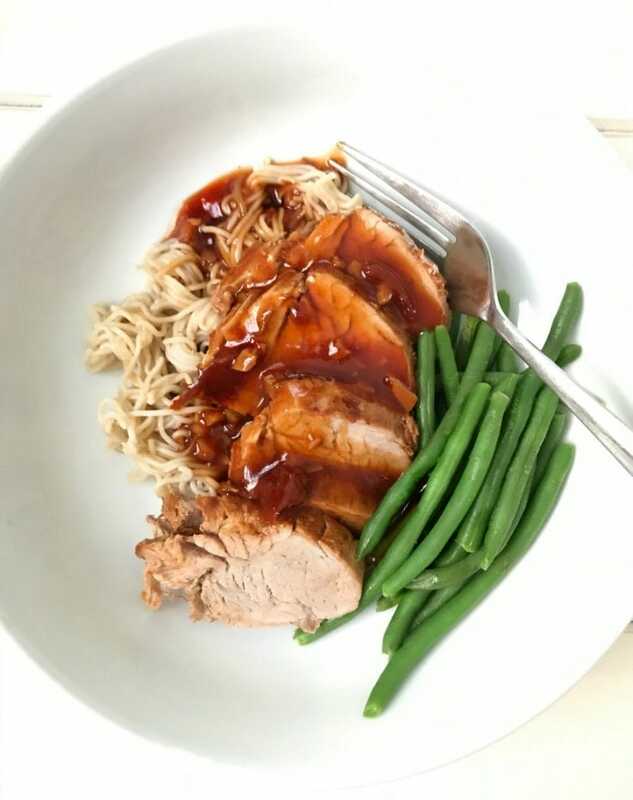 This 21 Day Fix Instant Pot Asian Pork Tenderloin is one of our new favorites – a fast, easy, and delicious dinner that’s FIX approved, gluten-free, dairy-free, and paleo friendly. This post contains affiliate links for products I am obsessed with. 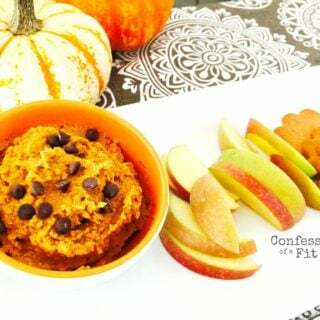 Confession #142 – I have a giant backlog of recipes to share with you and this post was NOT planned at all. But you guys. Omg. It’s so good, I had to. I didn’t even do a photoshoot because it was the first time I was recipe testing this particular combination and lately I’ve been testing new recipes first and then scheduling a session to photograph the recipe in process. Can I tell you something? I kind of miss the early days of making something yummy for dinner, snapping a quick picture, and then sharing it with you in practically real time. Those old photos, though, haunt me. I know I say this a lot, but I am so thankful for all of you who have been forgiving of my photography – old and new – because, let’s face it, even my newer stuff isn’t half as beautiful as I wish it was. One day, when my kiddos are both in school full time, I am going to kill it with photography. The only in process shot I took. Cheers! Until then, though, I will do my best. And when a meal is as delicious as this Asian Pork Tenderloin and I know my recipe output is moving slower than I want it to be, I am just going to share it. Are you cool with that? This has been on my list to try for awhile (again – backlog), but one of my readers beat me to it…and she messaged me and told me to make it asap. Robin C, you are spot on with this one. So damn delicious and I still can’t believe how easy it is to cook a pork tenderloin this fantastically perfect in the Instant Pot. 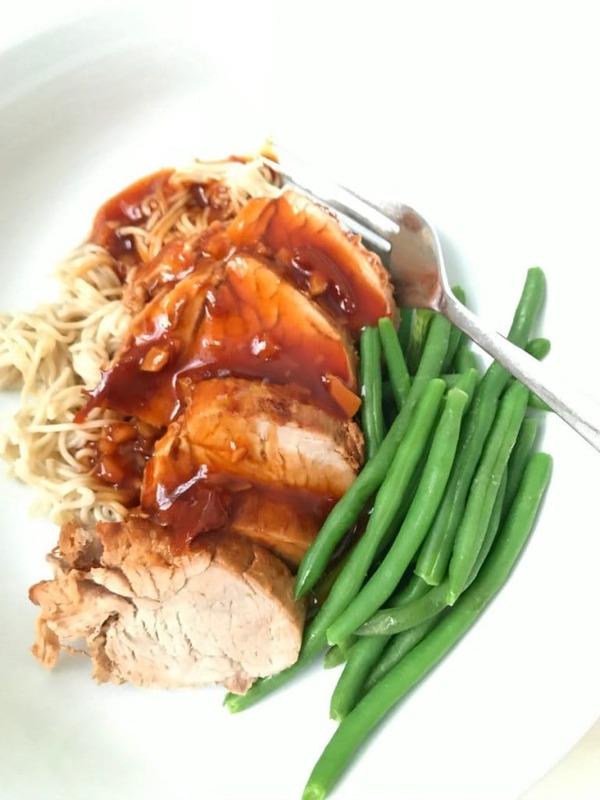 I served this Asian Pork Tenderloin over some of my favorite Brown Rice Ramen Noodles and some green beans, but the options for sides and veggie pairings are endless. If you want to steam your veggies in the Instant Pot, you can make them in a steam basket or in the sauce itself while the pork is resting. Just set it to zero or one minute (depending on the kind of veggies you use) and you are good! I am going to be experimenting with a pulled version of these flavors for a Asian inspired pork taco in the future, so be sure you come back soon (aaaaaaand…my recipe list just got longer, lol). Oh – and check out this video to see how quick and easy this recipe is! 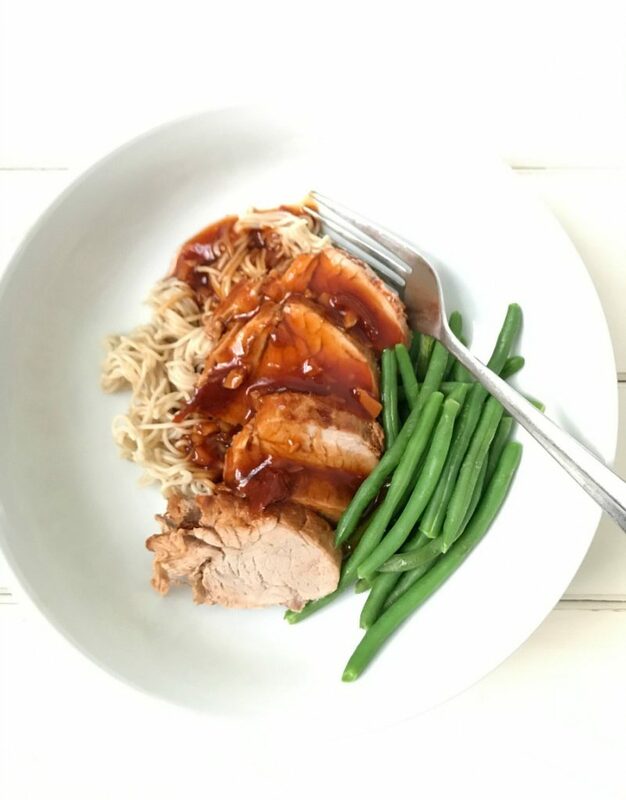 This 21 Day Fix Instant Pot Asian Pork Tenderloin is one of our new favorites – a fast, easy, and delicious dinner that’s FIX approved, gluten-free, dairy-free, and paleo friendly. Mix together honey, coconut aminos, tomato paste and 1 tsp of coconut oil and whisk well. *If using an 8 quart instant pot, add 1/3 cup of water to this mixture. Set Instant Pot to saute. When it’s displays the word hot, add 1 tsp of coconut oil to the bottom of the pan. Saute pork tenderloin on all sides until it gets to a nice golden brown, then sprinkle thoroughly with salt. Add an additional tsp of coconut oil to the pan along with garlic and ginger and cook for a minute or until fragrant. Turn Instant Pot off and stir in sauce. Place and lock lid on the IP, and set to manual/high pressure for 5 minutes. When cook time is up, natural pressure release for 6 minutes, then switch to quick release. Remove pork from Instant Pot and let it rest for at least 3-5 minutes while you thicken the sauce. Switch pot to saute and remove 1/2 cup of the sauce from the pot and add flour to thicken. 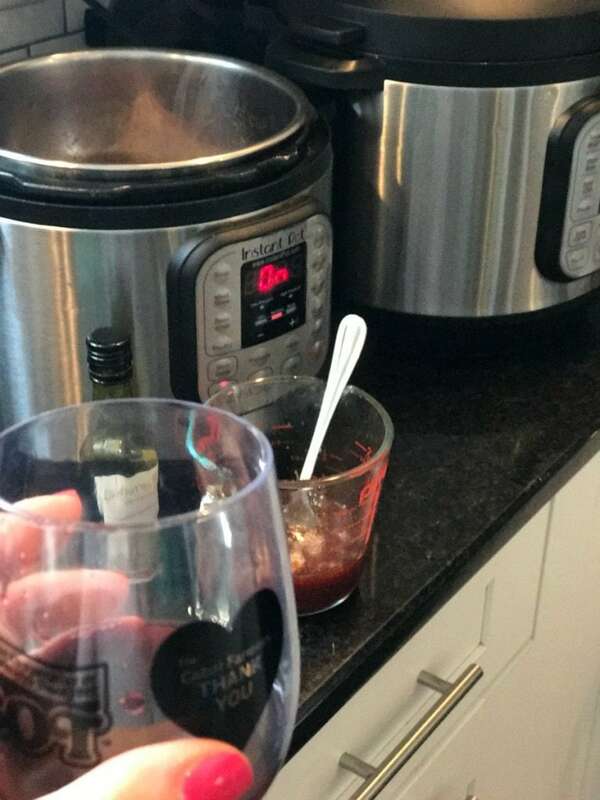 Pour the slurry back into the Instant Pot. Keep stirring until the sauce thickens, usually 1-2 minutes. Add crushed red pepper, if desired. 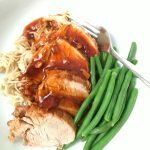 Slice pork and serve over brown rice ramen, brown rice, noodles, or noodles. Add veggies and top with sauce. This makes 4 servings – 1 RED and 1/2tsp each, plus sides! This was absolutely fantastic and we will for sure be putting this in our normal rotation! I recommend doubling the recipe and having leftovers! Yum! They best part (aside from the taste and the fact that it’s fix approved) is how easy and quick this was to make! Thanks for another great recipe! Hello, I don’t have an instant pot (yet!). Is there a slow cooker version? I will add the directions, but just cook it on low for 6-8 hours and thicken the sauce afterwards on your stovetop! You can cook it on low for 6-8 hours! Then just thicken the sauce in a saucepan. 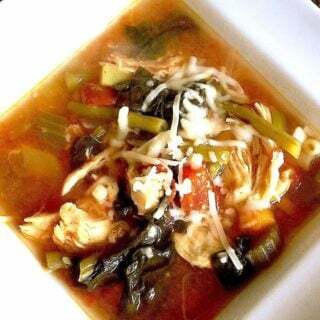 This recipe is wonderful – thank you! 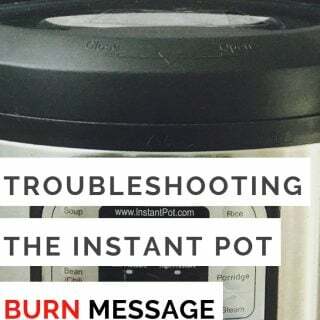 I was just wondering why the instant pot has a natural pressure release for 6 minutes? If I didn’t do this step, would I add more time to the initial cook time? Hi! The natural release does allow for more cook time, but it also ensures that the meat stays tender…meat can get tough with the abrupt change to quick release. Does that help? This might be why my meat hasn’t always turned out in the IP, because I’m quick-releasing. Good to know, thanks! Yes! It can definitely affect the tenderness! Made this for my family tonight… it’s a keeper! 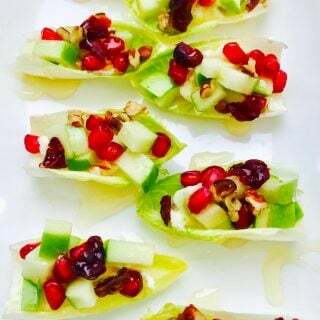 Thank you Nancylynn for posting such healthy, delicious recipes. Could you substitute turkey tenderloin instead of the pork? Does it change the cooking time? You can…but I am not sure how long that would cook. I plan to test it soon! What is coconut aminos? Can it be substituted for something else if I can’t find it in the grocery store? Also I’m a bit confused by the container count. You mention 1 red and 1/2tsp each. What is the 1/2tsp? i didn’t think you could have honey on the 80 day obsession? Autumn used a little in one of her recipes…if you make this, I would cut the honey down. What can be substituted for rice flour? Thanks! Any flour or thickener – gluten free or wheat based! Even cornstarch. What do you have on hand? This is another favorite for our family! My kids all had 3rd helpings and my brother who was visiting commented how delicious the meal was! Obviously it was a huge hit with everyone! We love your recipes! That makes me SO happy, Michelle! Thank you for taking the time to write and make my day! I made this on the stove. It was delicious. All I did was mix all the ingredients together and let the steak marinate overnight. Cooked it threw in some stir fry veggies. Definitely keeping this recipe for next time. I don’t know if 1 tsp of coconut oil is not enough (I actually used too, and it still wasn’t), but as soon as the pork touched the instant pot, it started getting stuck to it. I had to take it out and deglaze. Then, when I put in the ginger and garlic with 1 tsp of oil, it burned down again. Am I doing something wrong? I had to take the ginger and garlic out too, deglaze and wash the pot, then put in the pork and garlic and ginger mix back. Perhaps you should put your saute on low – it sounds like your pot runs very hot! You can always coat it with cooking oil spray, too!